The Bradford Rattlers are pleased to announce the re-signings of Erik Vlasic & Kyle Vigar to the 2016-17 roster. The veteran players are expected to play a much bigger role on this year's squad as overage players. Vlasic, 21, is a hardnosed defender coming for Toronto, ON. Erik played a big role on last year's club as a leader in the dressing room and is expected to do the same this season. He suited up for 27 games last season with the Rattlers. Vlasic is known as an outstanding team guy, willing to stand up for his teammates and give 100% every game. Vlasic is a product of the GTHL AAA minor hockey league. Forward Kyle Vigar, 20, was arguably one of the most improved players on last year's club. After working his way up the depth chart last year, but mid-point of last year Kyle was a integral part of the lineup is should build upon this coming into this year. 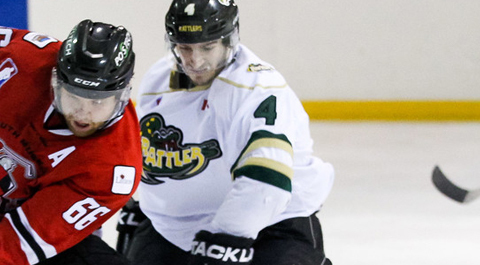 This will be Kyle's fourth year of junior hockey, having played Jr. C the two years prior to the Rattlers. Last year in 34 games Kyle notched 14 points (5g, 9a) despite playing most of the year on the blue line.